The BSA Martini International was created in 1950 as an improved version of the original small Martini action found on .22lr small bore target rifles and also in slightly different form on the Australian .310 Cadet rifle. The action of the Martini International was designed to provide everything that a small bore rifle shooter could possibly desire in their quest to achieve their best even if that journey would take them to the winner’s podium at an Olympic Games. The first version of the rifle was found to be wanting in the area of ease of trigger adjustments which led to the creation of the Mark II and later Mark III versions. Martini International Mark II action. Note that the action is bored to permit barrel cleaning from the breech end. The trigger mechanism is designed to be easily removed by undoing the large action screw located to the right of the receiver. (Picture courtesy rifleman.org.uk). The design of the BSA Martini International was strongly influenced by American Al Freeland who was building custom small bore target rifles on the original Martini small bore action in the late 1940’s. Al Freeland understood the limitations of the original Martini action as a competitive small bore action and the British Birmingham Small Arms Company decided to incorporate his ideas into a new version of the Martini designed for International competition – hence the name of the new rifle. BSA Martini International Mark II. The large action knob on the right side of the receiver is visible in this picture; unscrewing the knob allows the trigger mechanism to be withdrawn for adjustment. (Picture courtesy Rock Island Auction). One of the desirable features of the original Mark I Martini International was the facility to adjust the trigger weight, drag, and backlash. On the Mark I this required the removal of the trigger mechanism from the rifle and the use of custom Allan keys to do it. This was not something that could easily be done at the shooting line and so in the Mark II rifle (pictured above) the trigger weight and travel adjustment screws were re-located directly at the front of the trigger guard making their access much easier. 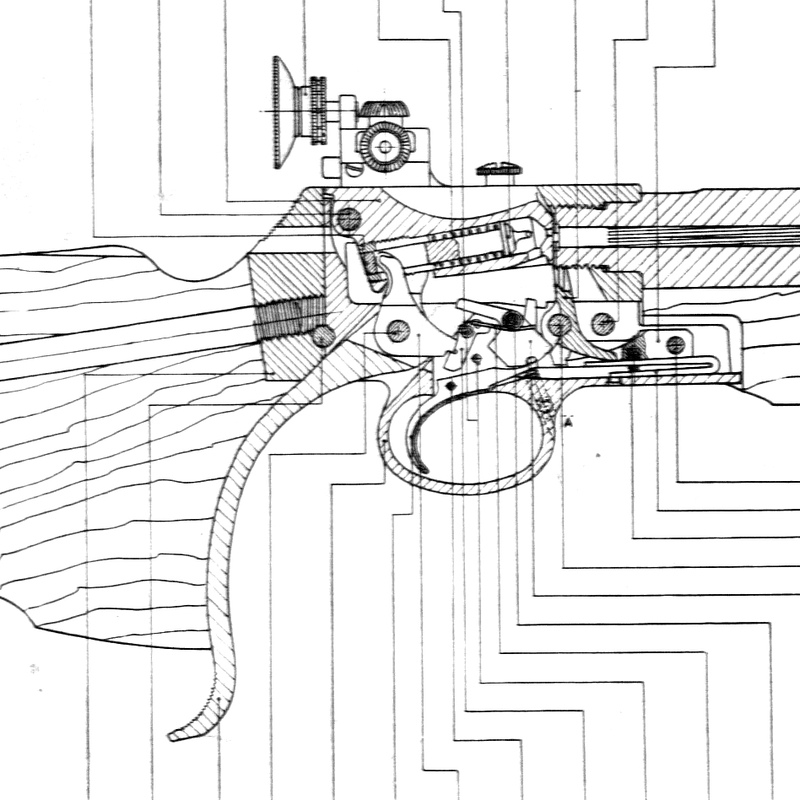 BSA Martini-International Mark II complete rifle diagram. (Picture courtesy rifleman.org.uk). As it was intended for international small bore rifle competition the Martini International rifles were fitted with micrometer adjustable aperture sights made by British company Parker-Hale. The Mark I was fitted with a quarter minute adjustable sight and the Mark II and III with eighth minute adjustments. The front sight tube was made to ensure there was no glare possible around the replaceable front sight element and a variety of front sight elements were supplied and available to suit the individual shooter’s tastes. As can be seen in the above diagram mounting blocks for a telescopic sight were also provided to accommodate the long target rifle-scopes of the period such as the Unertl. The Mark III action is longer as can be seen in this photograph. This rifle is fitted with an older style Redfield 24x rifle-scope. Also note the comb of the rifle stock is grooved to allow the passage of a cleaning rod as the comb is too high to permit that otherwise. (Picture courtesy Rock Island Auction). Amongst the advantages of the Martini action are that it enables the small bore marksman to keep his/her hold on the rifle undisturbed for reloading as they only have to move their trigger hand to operate the under-lever. The action was made to smartly eject the fired case so there was no need for the shooter to prise it out with their fingers, this enabling them to mentally focus on the target and not the mechanics of operation. The Martini action and chamber were intentionally designed to ensure the bullet would just engage in the rifling as the action was closed to ensure optimum concentricity and propellant burn consistency. The original barrels were made of Jessop steel and hand lapped to ensure the accuracy required. These rifles were tested from a machine rest and had to produce three consecutive ten shot 100 yard groups under minute of angle (i.e. under 1″). The two BSA Martini International rifles in this picture are coming up for sale by Rock Island auction in August 2017. (Picture courtesy Rock Island Auction). The BSA Martini International Mark II and Mark III rifles in the above picture are coming up for sale by Rock Island Auction in their on-line sale to be held on August 10th, 2017. You will find the sale page for this pair of rifles if you click here. Expected sale price of this pair is USD$700-$1,200. The BSA Martini International rifles are classic and highly collectible arms that, like a fine wine, tend to get better with age. If you are interested in detailed information on the BSA Martini International rifles from the Mark I to the Mark V the HARC-MCRRS, N.R.A.-(U.K.)- Historic Arms Resource Centre, Miniature-Calibre Rifle Research Site is recommended.